One Week … and Counting + Big News! Okay, a week and one day. But still! We’re so close! If you’re still on the fence about signing up – because 24 hours still seems like too many hours or because you’ve got a thing that weekend already – let me just reassure you that this is a low-pressure readathon. Do that thing you’ve got planned, sleep in, run errands. Generally enjoy your weekend, but integrate the readathon in however you can. Some ‘thoners will set a timer and diligently track their minutes and hours reading (which is awesome), but lots more will use the readathon to carve out significant amounts of weekend time to just read even if they don’t come close to hitting 24 hours. You do you. Read as much as you feasibly can and just enjoy the dedicated reading time. So go sign up. Do it now! That being said, there’s been a lot going on over on the social channels for 24in48, including a countdown to the readathon on both Instagram and Litsy. If you haven’t checked out the FAQ page, I highly recommend giving it a quick glance. If you’re curious about how to keep up with the readathon before, during and after next weekend, I’ll be posting updates here all weekend and in the lead up to readathon next week. On social, the official hashtag is #24in48 (though a lot of people also use #24in48readathon, I will only be using the official tag on the social handles). 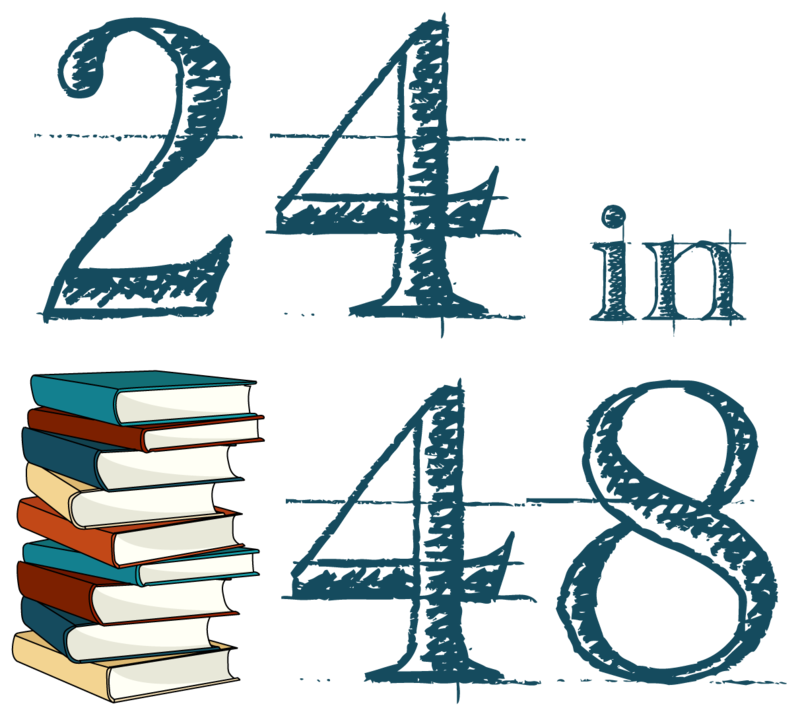 We’ll be all over Twitter (@24in48readathon), Instagram (@24in48), and Litsy (@24in48). If you’re not on Litsy, don’t fret. I’ll still be hosting giveaways and challenges here as usual. Okay, I think that covers a few basics. I’ll be back next week with more countdown fun and to see what everyone’s reading! Questions? Send me an email or drop me a note on Twitter. I can’t wait, you guys. It’s gonna be an amazing weekend! I love it! So excited to be part of this! !